The birthplace of Australian eco-tourism, Lismore is also the commercial centre of the north east of NSW and the home of Southern Cross University. However, for more than 6000 years before white settlement of the area, the original Bundjalung people had their own travel routes in the region, usually along the rivers. They even undertook special trips of up to 500 kilometres to the Bunya Mountains to cut the bunya nut cones which flowered every three years. They camped and ate the nuts and held corroborees at night, providing opportunities to trade both goods and culture with neighbouring tribes. Today’s eco-tour operators are merely shadowing the rich cultural life of the original settlers! The discovery and naming of the Richmond River by Captain Rous in 1828 provided the access necessary for shipping out the region’s ‘red gold’, the magnificent cedar which was to be steadily cut out from the ‘Big Scrub’, or subtropical rainforest which covered the region. It was only a matter of time before white settlement moved in on the rich landscape, almost completely finishing the clearing started by the timber-getters and displacing the Bundjalung from their ancestral lands. As the timber-getters were forced to move further and further west into the more inaccessible country, the Lismore area was opened up for pastoral runs, and by 1825, 21 licenses had been granted in the Richmond Valley. The original sheep run in what is now the Lismore area was located on the north arm of the Richmond River, and the station covered 23,000 acres, taken up by Captain Dumaresq around 1843. The sheep which were herded down from New England found the wetter sub-tropical climate not to their liking, and the losses caused by fluke, foot rot and other diseases led to the abandonment of the run. In January 1845, William and Jane Wilson took over the run, and named it Lismore, after a small island in a loch in the Scottish Highlands. They built a house at the far northern corner of the run within twelve months of arrival, and a second house by 1851 near the corner of the present Ballina and Molesworth Streets, which was known as Lismore House. Unfortunately, neither house survives. The Wilsons, however, were commemorated in 1976 by the re-naming of the north arm of the Richmond River as Wilson River. The siting of Lismore, first as a settlement and then as a town and city, was based on the realities of river transport, and was the furthest navigable section. Whilst this location was convenient for taking settlers as far into the new country as possible by boat, the riverside location has the predictable drawback of flooding, which remains a problem today. The predominance of shipping as the trading and travel connection with the rest of the state and country lasted until after WWII, when ships requisitioned for the war effort were returned in poor condition, while the railways had proven themselves as a new form of transport. However in the century of development which had preceded this change, the commercial centre and much of the infrastructure which had grown up close to the river was at risk of major flooding at least every decade. Back in 1855, however, such concerns were far from surveyor Frederick Peppercorne’s mind, and would probably have been considered as an acceptable inconvenience for the general access afforded by the river. He selected a township site in Wilson’s homestead paddock at the confluence of the Richmond and Wilson Rivers, and in 1856 the site was proclaimed the Town of Lismore. The primary industries of cattle grazing and timber-getting were soon supporting a growing population and the development of secondary industries such as ship-building, transportation, saw-milling, tallow manufacturing and other service industries needed by a growing township proceeded apace. During the first half of the 20th century, the dairying industry predominated in the region, with the formation of famous farmer cooperatives such as Norco processing and distributing the milk, butter and cream and providing more employment opportunities. Lismore continued to grow as the main commercial centre for the region, and was gazetted as a city in 1946. Another major highlight of the times was the 1954 Royal Visit by Queen Elizabeth II and the Duke of Edinburgh. Such was the fervour of the era that loyal subjects began gathering the night prior to the much-anticipated visit, and no less than five thousand people awaited a glimpse of the Queen and her consort, who were no doubt refreshed by their night’s rest in the Gollan Hotel! After more than a century of white settlement, Lismore was a thriving centre with plenty of opportunities for hardworking citizens and tourists to enjoy themselves. Aside from the well patronised sporting events, swimming pools, picture theatres, cultural events and shopping opportunities, which continue today, Lismore was developing a new night life. Many clubs expanded due to the income derived from the legalisation of poker machines in 1956 and offered entertainment and dancing as well as cheap meals. The clubs today still bring in well known performers and are a popular night out. That same year, those who wanted to stay at home and could afford a set could enjoy the wonders of one channel of television, with a second local channel being added in 1962. But as the 1960’s drew to a close, the dairying industry was finding the going much harder, and many of the smaller farms were sold or amalgamated or turned over to production of cattle or other produce. By the late sixties, the times were a’changing in the cities too, and many young people were looking for new ways of living. Artists and musicians were also looking for cheaper places to live, and there was a steady migration away from the cities to the country and coastal towns were many of these people had enjoyed family holidays, or travelled to surf or holiday after finishing school What they found was a beautiful climate, lush countryside, and very cheap rents. Soon some were buying up properties, seeing opportunities for back-to-nature living they’d only dreamed about in their city incarnations. Lismore’s teachers college had a large student population from various other areas as well as locals, and some of them returned after they had worked out their bond, having experienced life in a particularly congenial part of the country. The culmination of this new trend was the Aquarius Festival held in early 1973 in nearby Nimbin, a scenic little rural village which was finding the going tough as the dairying industry attempted to cope with the increasing economic and political changes which were affecting its former prosperity. Thousands descended on the town, camping out to experience Australia’s alternative to Woodstock, and many stayed, or returned having sold up and packed up instead of selling out. The many Utopian dreams which floated in the air along with other substances were never all going to be brought to fruition, but some answers were blowing in the wind. The newcomers discovered just how hard self-sufficiency could be, and there was disillusionment and casualties, but the ecological awareness which was generated as a result of the new respect for the land was part of the international awakening which created the green movement in the early 80’s. Protestor Falls, a spectacular waterfall in the Nightcap National Park commemorates one of the first major victories in preventing the logging of this rainforest area, which was gazetted in 1981 as a national park. Lismore in the 21st century is a fascinating amalgam of its history, both recent and ancient. The magnificent scenery showcasing hundreds of thousands of years of natural history is preserved in the many nearby national parks and world-heritage areas is a great attraction, and the Bundjalung people are experiencing a resurgence of identity and a reclaiming of culture which is enriching the whole region. 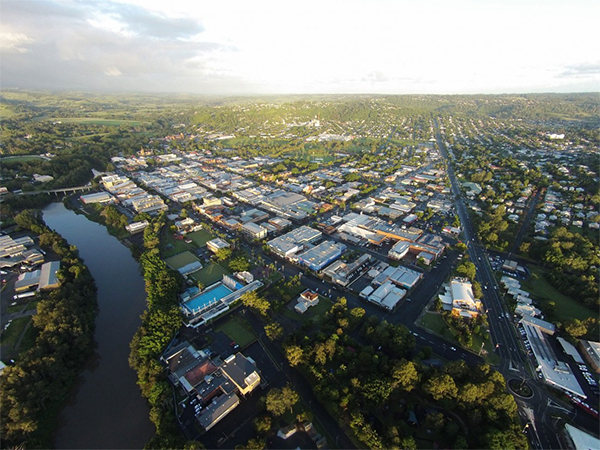 With its siting between the rainforests and the sea, Lismore no longer exists just as the region’s major commercial centre, but is also a tourism gateway to the region, with its own jet airport and many different roads and highways leading from the city. Lismore has always had a strong cultural life, and there are many festivals, theatre productions and groups and a very active regional gallery with monthly exhibitions. Norpa, a regional theatre company, presents many national and regional performances, and Southern Cross University draws students from around the country. Sports are well represented in Lismore, with an excellent sporting ground for major events at Oakes Oval, dozens of playing fields and tennis courts, several gymnasiums, horse and greyhound racing tracks and the very popular Speedway Circuit, the largest in the region. Suburban development has spread over much of the original farmland surrounding Lismore, while other people live in the many surrounding villages and commute to Lismore. Nimbin is probably the most famous village, but The Channon draws visitors to its arts and crafts galleries, and its famous monthly markets, whilst Bexhill has its beautiful outdoor cathedral, and many others have great coffee shops and galleries for hinterland visits.